The DG5MK LCQ-Meter - a simple but effective tool to measure L, C and Q. Measuring resonance frequency and quality of LC tuned circuits can become quiet complex, time consuming and also expensive in terms of needed measurement equipment. This article describes a very affordable hand-size measurement tool, the LCQ-Meter, which allows among other things measuring resonance frequency and quality of parallel tuned circuits and capacitance and inductance of involved components. Some do-it-yourself HAM Radio operators own measurement equipment like oscilloscopes, spectrum analyzers, network analyzers, impedance measurement equipment and much more which would easily compete to some standard equipment in electronic laboratories. But nearly all of them own a simple microcontroller-based meter to measure capacitance and inductance because it is cheap, easy to handle and has an accuracy which fits to amateur needs. The original design probably goes back to AADE around 1997 who still sells his original, very accurate L/C-Meter at an affordable price . Since then hundreds of clones came up, finally flooding eBay from China. The funny thing is there was no evolution at all. Most circuits are still based on the same old LM311 comparator oscillator whilst some newer ones take microcontroller-internal comparators, but no change on the principles. For a recent HAM Radio project I needed to measure inductors and capacitors which was easily done with my AADE like L/C-Meter, but I also needed to measure some wired LC tuned circuits and was also interested in the quality Q of that circuits. An idea came up to build something new, smart and handy which could do the job much easier with no additional effort at all. 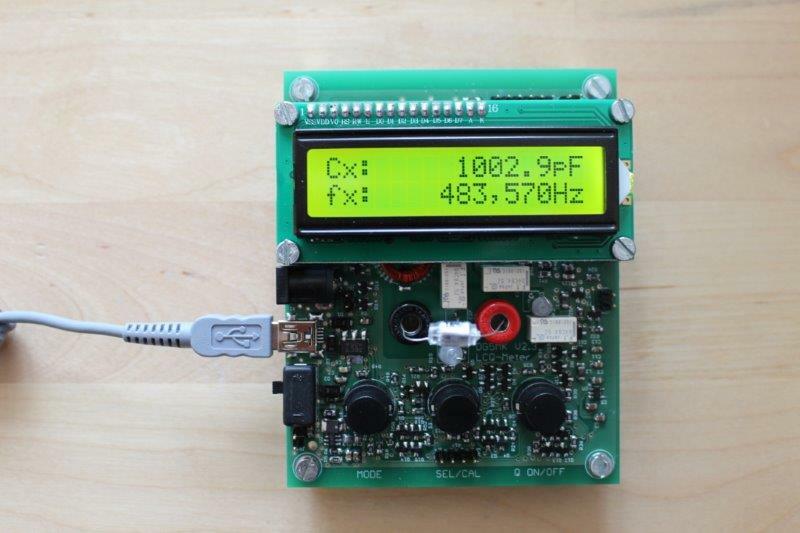 The guiding principle for the development of the LCQ-Meter was to build small equipment at low cost for HAM Radio needs. It had to include measurement of capacitance and inductance on isolated components as the AADE like L/C Meters. But it also had to include the measurement of capacitance and inductance within a wired LC tuned circuit, the resonance frequency and as a key challenge the unloaded quality Q of that circuit. Having small equipment and low cost in mind there would be tradeoffs in terms of accuracy and measurement range, off course. After some hundreds of hours of development, simulation, building, testing and measuring this article describes the current final design of the LCQ-Meter (HW V2.3 with SW V7.0 from 08.2015). The article starts with some theoretical background on tuned circuits and especially on quality Q measurement to help understand the overall design. Evaluating the advantages and disadvantages of the different measurement methods along a simple example guides to the current implementation of the LCQ-Meter. Too heavy mathematics including Complex Numbers is avoided but a basic framework is given for those readers who are interested in the background. Following a deep dive on some key components used the article describes the overall implementation and software for the microcontroller. After some practical measurement examples the article closes with discussing the accuracy of the LCQ-Meter.